A recent US Navy demonstration during the ongoing Rim of the Pacific (RIMPAC) 2012 exercises in the Pacific saw an entire aircraft carrier strike group run exercises using biofuels and other eco-friendly energy sources. But the navy’s biofuels push, headed up by Secretary of the Navy Ray Mabus, has recently come under fire from powerful detractors. Rowan Watt-Pringle finds out what the 'Great Green Fleet' symbolises in terms of innovation, energy security and environmental benefits. Servicemen prepare an F/A-18E Super Hornet aboard the aircraft carrier USS Nimitz (CVN 68) to participate in the Great Green Fleet demonstration, during Rim of the Pacific (RIMPAC) 2012, in and around the Hawaiian Islands. Twenty-two nations, more than 40 ships and submarines, more than 200 aircraft and 25,000 personnel are participating in the world's largest international maritime exercise, from June 29 to August 3. Ray Mabus tours a biofuels testing facility at the Naval Postgraduate School, where he outlined a new master's degree programme in a speech to the institution's student body. 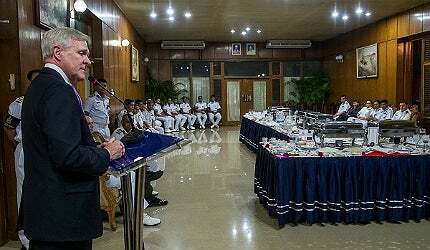 Secretary of the Navy Ray Mabus delivers a talk in Dhaka, Bangladesh, where he discussed partnerships, maritime security, alternative energy and stability throughout the region of south-east Asia. "This is not the US Navy’s first foray into biofuels, with several previous exercises producing positive results." Five ships began the Rim of the Pacific (RIMPAC) 2012 exercise running on a 50-50 blend of petroleum-based marine diesel or aviation fuel, mixed with 450,000 gallons of biofuel produced from used cooking oil, chicken fat and other waste greases and algae. This is not the US Navy’s first foray into biofuels, with several previous exercises producing positive results. In October 2010, for example, a riverine command boat was put to the test in Virginia – powered by a revolutionary, 100% algae-based fuel – with no discernible loss of performance. But the shift to using alternative energy appears at first glance to come at a price, and quite a hefty one at that. At $12m, the biofuels acquired for the Great Green Fleet cost roughly four times more than conventional fuels; detractors are using this as a stick with which to beat Secretary Mabus and his biofuels programme, which aims to cut in half the navy’s dependence on fuel derived from oil by 2020. Conservative lawmakers in the US recently voiced strong opposition to the military’s various biofuels initiatives. Indeed, the House Armed Services Committee – in its report on next year’s Pentagon budget – placed a blanket ban on the purchase of any alternative fuel which costs more than what they termed "traditional fossil fuel". "American Veterans (AMVETS) asserted that current US military operations are demanding more and more energy." While they may claim that this doesn’t amount to political power games or an attempt to smother the fledgling biofuels industry (Representative Randy Forbes claimed that "It’s a matter of priorities," with the priority being to supply additional ships, planes and prepositioned stocks to troops stationed abroad), the reality is that if this law is passed it will impose virtually impossible restrictions on biofuel production, effectively killing this micro-industry before it truly gets off the ground. Contrast this with the political, financial and infrastructural might of the fossil fuels industry, which has been around for a century-and-a-half (the first oil well was drilled in Pennsylvania in 1859) and it becomes clear just how imposing the task of setting up an effective biofuels industry which can compete with the price of petroleum-based fuel will be. In a 2010 email to Noah Shachtman, non-resident fellow at independent research and policy institute The Brooking Institution, an unnamed Pentagon official voiced his concerns that: "Developing non-petroleum supplies of fuel does not, by itself, affect any form of military vulnerability… Strategically, we’ll always be able to get petroleum – it may cost a lot, but we can get it … Reducing demand, not substituting one fuel for the other, will reduce that vulnerability." While consumers can find ways to use less fuel, however, the DoD can’t. In fact, American Veterans (AMVETS) – one of the country’s leading veteran service organisations – asserted that current US military operations are demanding more and more energy. In addition to this, a domestic biofuels industry would be inherently and exponentially more secure than reliance on an increasingly volatile global oil market. This corroborates Mabus’s claim that an alternative fuels industry would help to ensure the navy’s energy security by removing its reliance on oil sourced from volatile regions of the world, while the unnamed official simultaneously failed to touch on the argument put forward recently by Conservatives – namely, that high costs should exclude biofuels as an alternative to petroleum-based fuel. Senator John McCain, meanwhile, the leading Republican on the House Armed Services Committee, not only said that the use of alternative fuel was unaffordable, but that it was not the navy’s place to "drive innovation". "Conservative lawmakers in the US recently voiced strong opposition to the military’s various biofuels initiatives." Mabus agreed with McCain that the issue is not just about price, but for vastly different reasons: "We simply buy too much fossil fuels from places that are either actually or potentially volatile … We would never let these places build (our vehicles), but we do give them a say on whether those… vehicles operate because we buy so much energy from them." AMVETS believes this problem can be solved through: "A domestic advanced biofuels industry producing cost-competitive fuels (which) would directly reduce our reliance on oil and keep US taxpayer dollars at home." AMVETS has wholeheartedly backed the move to alternative energy, rubbishing Forbes’s assertion that prioritising biofuels would negatively impact military operations by writing: "In 2011, the Pentagon saw a 26% increase in fuel costs from the previous year. "To pay this unplanned higher cost, the Defense Department (DoD) had to shift $3.6bn in its annual budget, which came at the cost of new, better equipment and training for our troops." DiPasquale drove this home by pointing out: "Every time the price of oil goes up by a dollar a barrel, it costs the navy $31m… arguments (citing the higher cost of biofuels) ignore the drain on America’s defense budget from oil spikes." RIMPAC 2012 is to be the 23rd such exercise since its inception in 1971, and will once again take place in the islands surrounding Hawaii. In fact, a CAP analysis found that the most recent oil price spike cost the DoD $123m more for oil purchased from January to May 2012 compared to the same period last year. Daniel Weiss, director of climate strategy at CAP, added: "There’s no end in sight for the strain of high oil prices on the DoD. According to Energy Department statistics, world oil prices will average an estimated $145 a barrel in 2035 (in 2010 dollars), up from the current $85 to $110 range this year." A few months ago, Mabus emphatically countered Representative Forbes’s assertion that this debate is about "priorities", informing the Senate Subcommittee on Water and Power that Forbes’s point is based on a "false choice" between more ships and a different fuel source; without an alternate fuel supply and a "secure domestic supply of energy at an affordable price," these extra ships would still be reliant on a potentially insecure fuel supply, negating the benefits of having them in the first place. Weiss was also quick to refute Forbes’s argument, stating: "Rep. Forbes argues that studies show biofuel will always be more expensive than petroleum, but the DoD’s purchase of small amounts of biofuel for research and development has already dramatically reduced its price, as manufacturers streamline production processes," adding that according to Mabus the cost of biofuel had already been halved in the space of two years. Lawrence Korb, CAP Senior Fellow and former assistant secretary of defence under President Ronald Reagan, noted that despite McCain’s assertion that a naval-driven biofuels industry was unaffordable, there were many other ways to reduce Pentagon spending. Korb outlined responsible defence cuts that could save $600bn during a decade without undermining national security. Just one example of this is the fact that the House Armed Services Committee’s proposed budget also includes "pet projects" such as a $5bn initiative for a House GOP provision to build an East Coast missile defence system that the military doesn’t even want. More than 40 ships, six submarines and 200 aircraft are due to take part in the largest international maritime warfare exercise. Weiss was also adamant that McCain was wrong to claim the navy should not be driving innovation: "The recent attacks on the navy’s efforts to innovate and reduce its dependence on oil are counter to the long and historically bipartisan support for DoD-related energy technology innovation. The navy’s goal of using biofuels to supply roughly half of their non-nuclear fuel needs by 2020 is part of this tradition." Indeed, AMVETS noted that this type of forward-thinking investment is by no means unprecedented and that, as a nation, the US has regularly responded to national security challenges to ensure that its domestic capacity to produce vital materials was maintained, citing historical examples such as the formation of the American computer chip industry, as well as domestic production of titanium and aluminium. DiPasquale concluded that, as the world’s single largest energy consumer (excluding nations) the Pentagon – and by extension the navy – is perfectly placed to drive such innovation, highlighting a quote from Mabus in a recent Reuters article: "Navy has been at the forefront of energy innovation for [more than] a hundred years … transitioning from sail, to coal, to oil and then to nuclear from the 1850s to the 1950s … Every single time there were naysayers. And every single time, every single time, those naysayers have been wrong, and they’re going to be wrong again this time."